We produce a variety of traditional dry white wines and red wines, which are great companions for all types of “gastronomie”. They reflect the fine expression of the grape’s flavour and are balanced by influences from the soil and climate. This is the reason why we harvest grapes from our different vineyards separately, thus respecting their unique qualities. Our wine making process respect all the freshness and the fruitiness of our grapes. All our grapes are hand-picked to preserve their integrity and quality. We do long pressing with a pneumatical press (6 to 7 hours). Our wines do natural fermentation without the use of artificial yeast in order to maintain their link to the terroir. After the fermentation, the wines age between 6 to 10 months in our cellar. We use wood casks or stainless steel tanks. 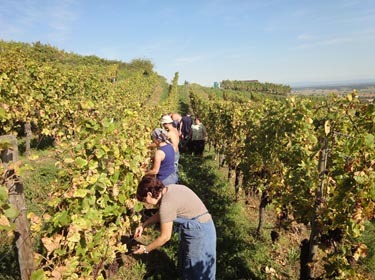 Pinot Gris Grand Cru Kirchberg.